On Thanksgiving Day 2013, my husband and I found ourselves in San Francisco for 24 hours. This was just a part of a quick holiday weekend getaway that subsequently included 2 nights in Vancouver. Since we knew we would be in San Francisco on a holiday evening, it was important to us to find a restaurant that would be open for Thanksgiving dinner. In the end, we dined at Butterfly Restaurant at Pier 33 on The Embarcadero. I wrote about our amazing experience at Butterfly in early 2014. While the dinner was a set menu, which we were trying to avoid, my husband and I agreed that it was the best Thanksgiving dinner we’d ever had. While the dinner included the traditional Thanksgiving fixings of turkey and stuffing and everything in between, everything on the menu that night was prepared with an Asian flair which made it both unique and spectacular. About a week before New Year’s 2015, my husband found out that he’d have a long weekend as his office was going to be closed starting New Year’s Day. It turns out that shortly before that, I also found out that my office was going to be operating on the same schedule. With that in mind, my husband did some research and asked me if I might be interested in flying up to San Francisco for 48 hours over the New Year’s holiday as a bit of a quick getaway. After we finalized our plans, we started talking about what we wanted to do during our quick 48 hours in the Bay Area, and one thing we both agreed on was that we both wanted to go back to Butterfly Restaurant and dine there again on a night where we could try their regular menu, not their special holiday menu, and see if the restaurant was as good as we both remembered it to be. We ended up making reservations for the evening of New Year’s Day, and while New Year’s was still technically a holiday, the restaurant was serving up their full menu, which is exactly what we wanted. The great thing we’ve discovered about Butterfly is that since it’s located in a very touristy part of town along The Embarcadero Waterfront and just south of Fisherman’s Wharf, the restaurant is pretty much open for all holidays, which as a tourist is an important fact. Since we knew we’d be in the Fisherman’s Wharf area on the evening of New Year’s Day, it was just a hop and a skip to make our way down the waterfront for dinner at Butterfly. Luckily, New Year’s Day evening turned out to be a low-key affair at the restaurant rather than being packed to the gills, so we really had an opportunity to enjoy the restaurant, the atmosphere and the food. We started off the night with a couple of drinks. My husband fondly remembered the last time we were at Butterfly when he ordered a bottle of Anchor Steam, a locally brewed beer. 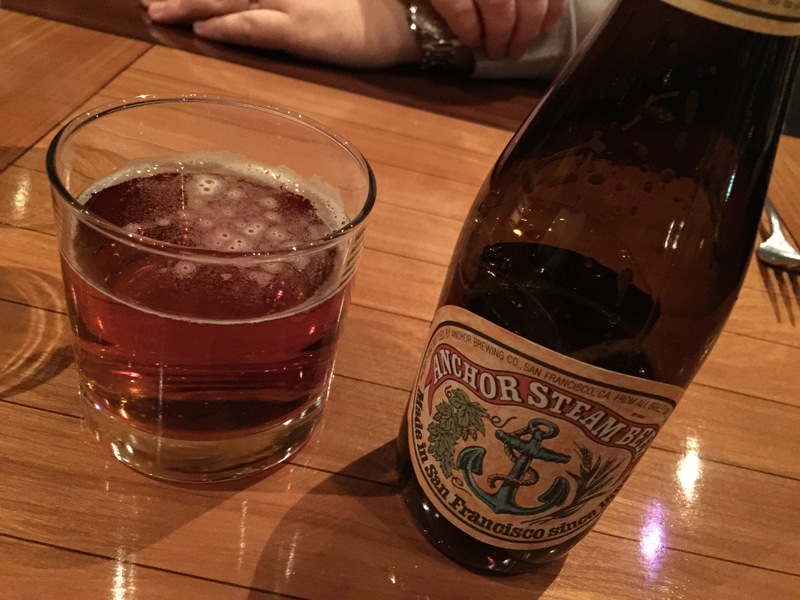 Celebrating a return trip to San Francisco, my husband decided local brewed beer was in order again and decided to enjoy his meal with an ice cold Anchor Steam. I settled on a concoction called the strawberry sprits. 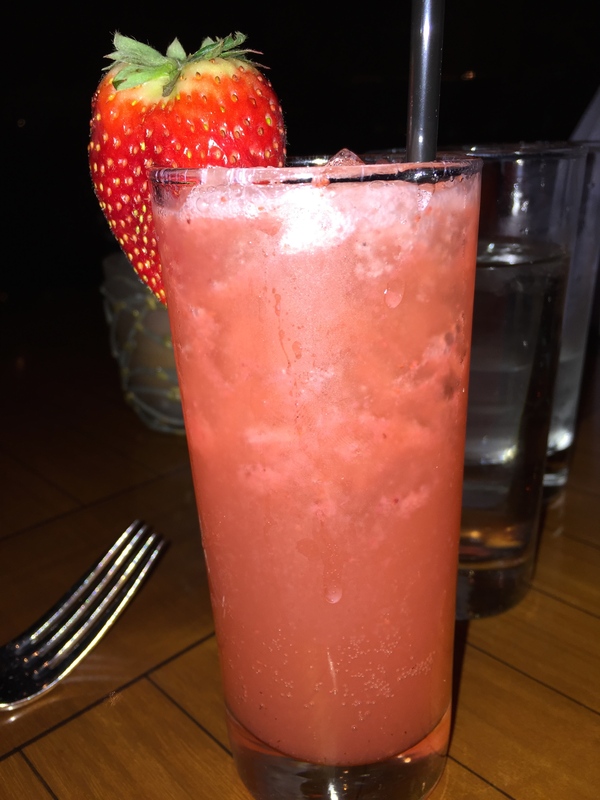 Made with local Lucero Farms strawberries, fresh lemon, and soda, the drink was fizzy with a subtle sweetness from the fresh strawberries. The lemon added a refreshing tanginess to the drink to offset the soda and the sweetness. I found the drink to be light and refreshing and quite palate cleansing as well. I don’t understand why more restuarants don’t offer a wider selection of non-alcoholic mocktails. We start our New Year’s meal with 2 appetizers. 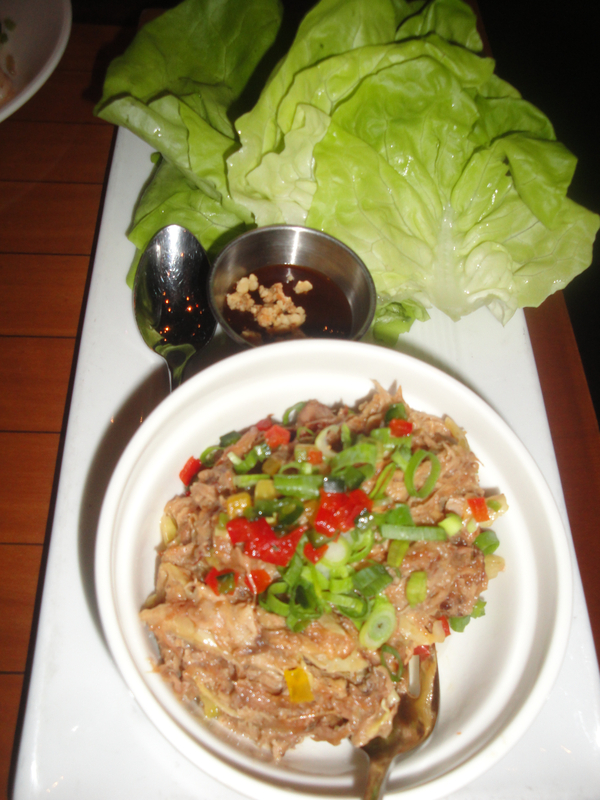 The first is the kalua pork and butter lettuce cups. Delicious kalua pork topped with pepper brunoise and scallions is served along side a small saucer of hoisin bbq sauce with toasted cashews and crispy, cold butter lettuce. The idea is to make a lettuce cup. Take a leaf of the butter lettuce, fill it with spoonfuls of the kalua pork, and top it with some of the hoisin bbq sauce, roll it up so the ingredients stay inside the lettuce leaf and enjoy. First off, the kalua pork was tender, extremely moist, and incredibly flavorful. There’s an art to making good kalua pork that doesn’t come out too salty, but yet is full of flavor, and this hits all those notes. The bbq hoisin sauce is a good, sweet compliment to the rich pork. And the butter lettuce is a great vessel for this dish as it’s crisp, fresh, and has a bit of a sweet taste itself to compliment the rich pork. The idea of lettuce cups is such a fun, interactive one that wastes nothing as you have to eat every portion of the dish and the creativity of using the lettuce leaf as a serving vessel is terrific. I’ve never seen kalua pork used in a lettuce cup before, and thought this was fun, and different, and definitely an Asian fusion flair that I associate with Butterfly Restaurant. Our second appetizer was a dish that my husband insisted that we order. Though, he didn’t really have to convince me of it because I had already been eyeing it on the menu. 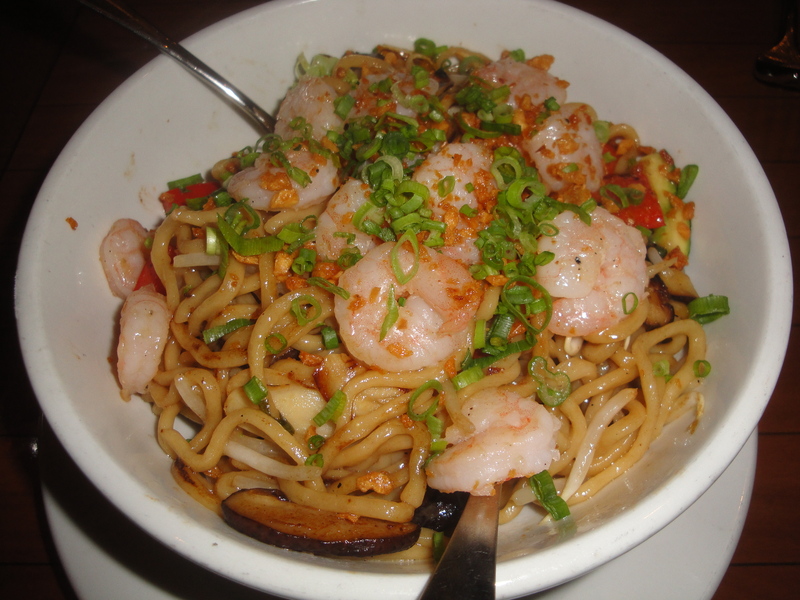 Wok seared Shanghai garlic noodles with minced scallions, toasted garlic and the addition of shrimp was out-of-this-world fantastic. In fact, after one bite, my husband was in love. By the time we finished the dish, my husband said that this particular dish was approaching “best thing I ever ate” status. Afterwards, my husband said that he wishes he would have just ordered this dish on his own without having to share with me because it was so good he didn’t want to share, it was so good he could have eaten 2 bowls on his own. Even now, months later, he still talks about how amazing this dish is. I might not have been as vocal about my love for this dish, but believe me, this dish was incredibly memorable. The addition of shrimp to the dish was perfect as the shrimp were perfectly cooked, of a very good size, and plentiful. The flavor that hits your senses first is the garlic, and we all know that my husband and I are huge garlic lovers. The toasted garlic gives the dish a beautiful aroma, nice flavor, and terrific texture since it’s not just sautéed garlic, but toasted crispy garlic. The noodles were perfectly cooked, and every flavor of the dish came together so perfectly in the wok with a little bit of a golden brown and lightly crispy feel it just made you want to gobble up the whole dish. This is one of those dishes you always remember, the flavor, the feel, the texture, everything about it was just so perfect it’s hard to describe. Continuing on his love for duck, my husband ordered the roasted Peking duck for his meal. The dish was not your typical Peking duck with the crispy skin and the steamed buns, but rather a showcase of Peking duck two ways. 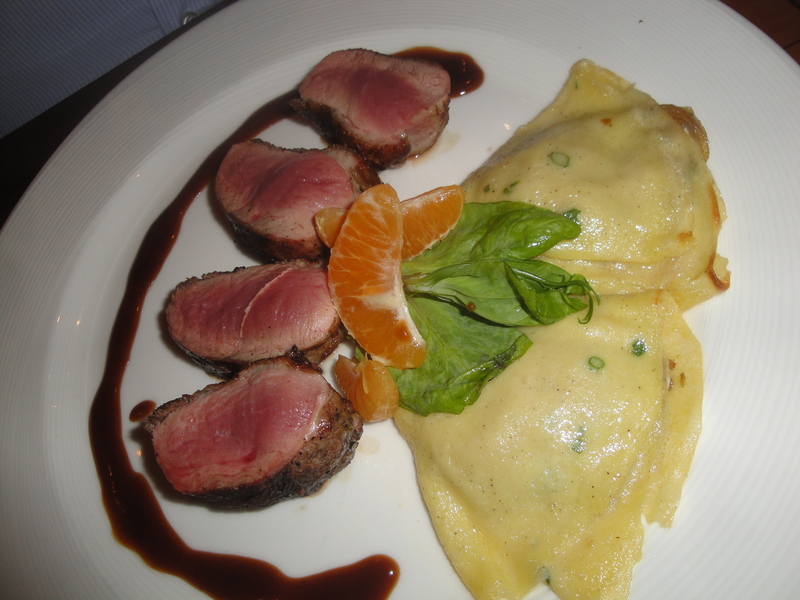 First off, there is a seared duck breast cooked to a perfect medium rare and sliced, served alongside hoisin sauce. The second way is duck leg confit crepes with Brooks Farms sunflower sprouts. The crepes looked like large, overstuffed raviolis on the plate and at first I had forgotten what they were supposed to be. My husband said that the crepes were perfectly cooked with an eggy batter to make it more savory. The inside of the crepe was stuffed with duck leg confit that my husband said was very tasty. To me, it looked like it was jam packed with duck leg meat. But the real star of the dish was the seared duck breast. When the waiter recommended medium rare for the duck breast, my husband agreed, and the chef seared it to a perfect medium rare. My husband thought that the duck breast was incredibly tender and within minutes, he had cleared his plate. Clearly, he was more than satisfied with his meal. I decided to go with a seafood dish for my entrée. Sesame crusted ahi tuna served with a shrimp and scallop stuffed onion ring, soy and pepper brunoise, celery root coulis and Four Sisters purslane sounded delectable to me. The waiter had told me that the ahi tuna would be served rare on the inside and seared in a sesame crust on the outside, all of which I found to be perfectly fine. If you’re going to order ahi tuna, you may as well enjoy it the way the chef recommends. First off, I’d never had purslane before, long considered a weed, it’s actually a very healthy, and edible green, which to me reminded me of microgreens, just of a larger size. The shrimp and scallop stuffed onion ring was exactly as it’s described, a very crispy, and well fried onion ring laid out on the plate and stuffed in the middle with a mixture of sautéed shrimp and scallops and the celery root coulis. The celery root was terrific as it was quite reminiscent of mashed potatoes that I found quite tasty. The sautéed shrimp and scallops were quite plentiful, and their sweet flavor was a good compliment to the lightly flavored celery root coulis. Combining everything with the slightly salty soy and pepper brunoise created a great balance of flavors with the salty, sweet, and bland coming together. Finally the sesame crusted ahi tuna was perfectly prepared. The tuna was incredibly fresh, and tender and soft like running your fork through soft butter. The sesame crust on the outside gave the tuna a nice nutty flavor. 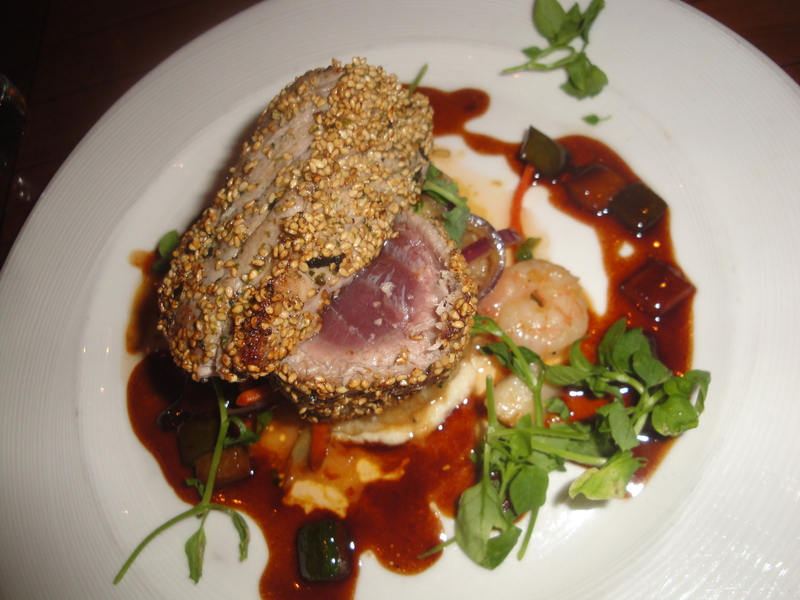 This dish was truly an Asian fusion dish with flavors such as ahi tuna and soy and sesame coming together with items such as celery root coulis and onion rings. This was, hands down, one of the best tuna dishes I’ve ever enjoyed. My husband and I must have been hungry, though it’s no wonder since we essentially hadn’t eaten anything all day. When we were presented with the dessert menu, it wasn’t a question of what we would order, but more so a question of who would order what. I even went so far as desiring a nice after dinner drink as well, and when I saw that the restaurant offered chilled Vietnamese coffee, I couldn’t resist. 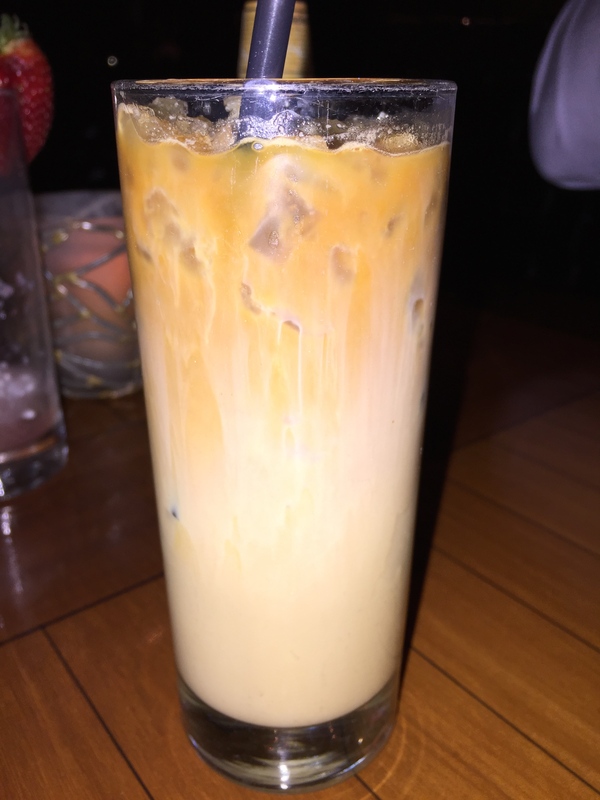 Iced coffee has always been a great weakness of mine and whether it be Thai iced coffee or Vietnamese iced coffee, I’ve often not been able to turn it down. That hint of sweetness that hits you from the use of condensed milk is the kicker for me, combined with the incredibly fragrant and aromatic Vietnamese style of brewing coffee, it’s a perfect pair. For dessert, my husband opted to order the banana bread pudding. Served a la mode with Mitchell’s macapuno ice cream and a banana brûlée on the side, the dessert looked mouthwatering. I had to steal one of the bruleed banana slices, I couldn’t help myself. Banana-anything, especially when it comes to dessert is another weakness of mine. The wonderful flavor of the torched sugar atop the ripe banana slices was incredible. The banana bread pudding itself was sweet and bready. 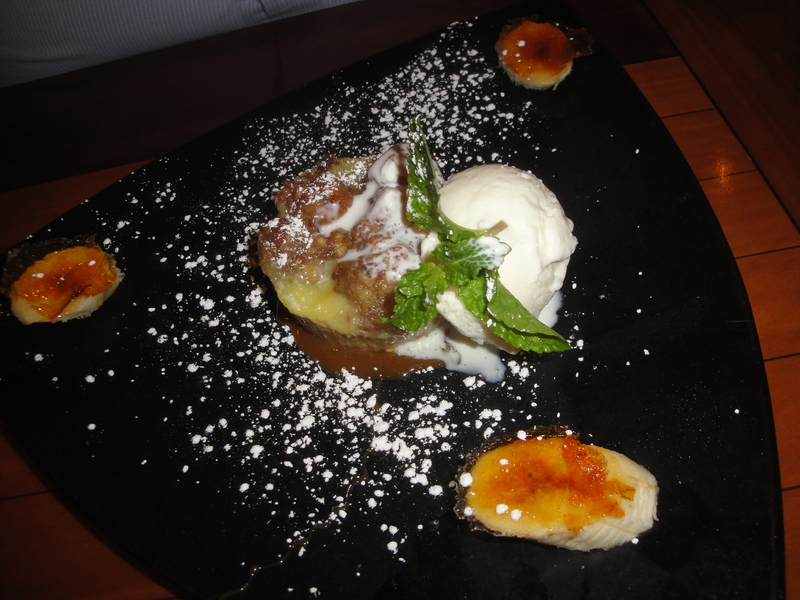 You could definitely taste the subtle flavors of banana in the bread pudding which was baked to perfection, cooked through, but with a bit of moisture and custard texture to it. Mitchell’s ice cream is a local San Francisco creamery with unique and interesting ice cream flavors that they make with 16% butterfat. Their macapuno ice cream is sweet, meaty coconut meat imported from the Philippines. This rich, coconut ice cream was a perfect compliment to the banana bread pudding. You could taste the sweet coconut immediately and the ice cream was smooth, creamy and delicious. Being bread pudding, this was a filling dessert, and I loved how every element of the dessert could stand on its own, but coming together as three different components, it made perfect sense and tasted incredible. I also chose a banana dessert from the menu. My choice was the banana lumpia rolls served with warm bananas foster and topped with coconut ice cream and fresh sliced strawberries. I’ve had different versions of banana lumpia rolls, or banana egg rolls before. You take slices of banana, wrap it up in wonton wrappers or egg roll wrappers and deep fry it to a nice golden brown. Slice the rolls up on a bias and you have a terrific, and flavorful banana lumpia roll. The outside of the roll is flaky and crispy and is a perfect pairing with the hot, sweet ripe banana slices inside. However, at Butterfly, the banana lumpia rolls with a scoop of warm bananas foster ladled over the top of the hot lumpia rolls took this dessert to another dimension. 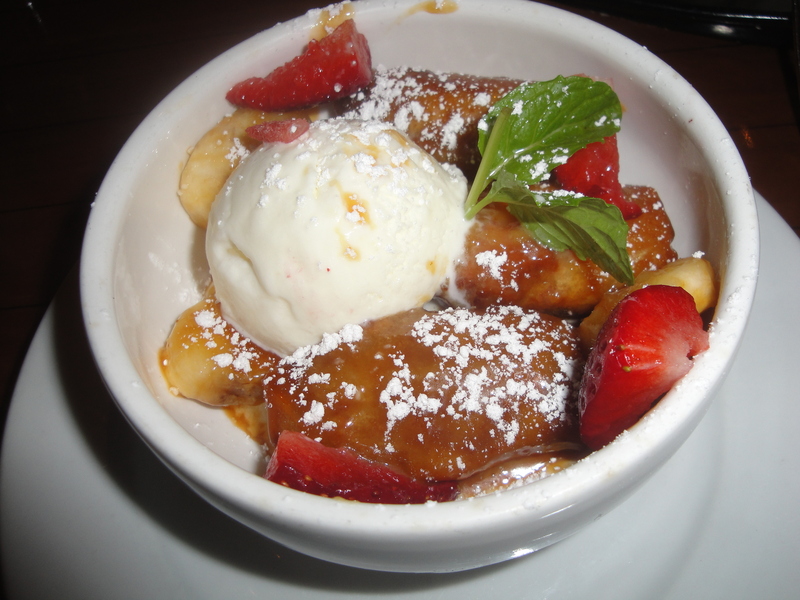 The bananas foster was incredible, sweet, tasty, filled with bananas and cinnamon and incredibly delicious. It was like putting 2 amazing banana desserts together and combining them into one out-of-this-world banana dessert. I felt like I’d died an gone to banana heaven. Top the whole thing with some sweet coconut ice cream and some tangy fresh strawberry slices, and I’m not sure you could ever concoct a more delicious banana desert. This definitely ranks up there as one of the best desserts I’ve ever put in my mouth. 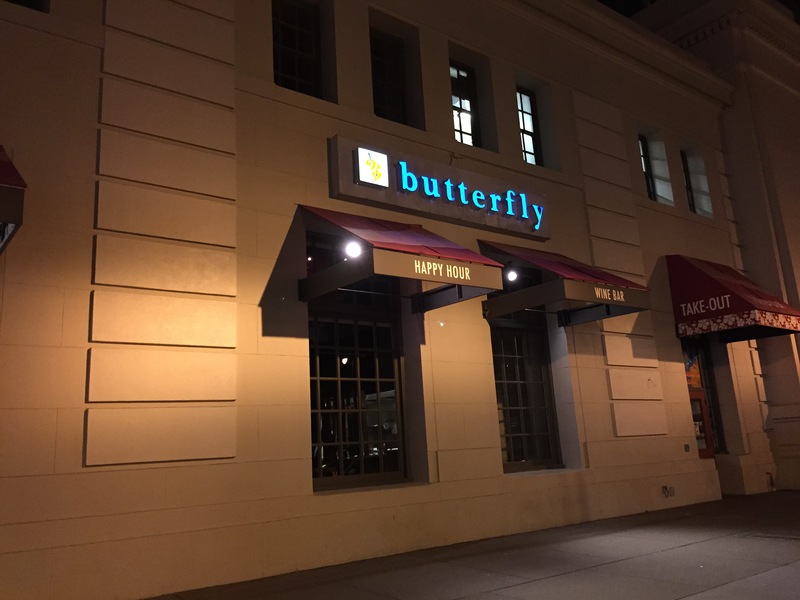 When my husband and I put together this quick getaway trip to San Francisco, we both immediately agreed that we wanted to go back to Butterfly Restaurant again. After our experience at the restaurant on Thanksgiving evening in 2013 when we both had an amazing time and a wonderful meal, we wanted to go back and experience what the restaurant had to offer with their regular menu rather than their special Thanksgiving menu. When we walked out of the restaurant after dinner this time around, we were full, satisfied, and both incredibly glad we had decided to go back to Butterfly. Located on the Embarcadero, the restaurant is in an incredibly location with a beautiful view out to San Francisco Bay, a beautifully designed and understated interior design, and Asian fusion food that is out of this world. Every dish we ordered and enjoyed built was better than the previous dish, almost like a crescendo building up to a spectacular grand finale with desserts that I couldn’t stop shoveling into my mouth. I have no doubt that the next time my husband and I head to the Bay Area again, Butterfly Restaurant will make our list of places we have to dine at.